It is not just women applicants, women students, and women MBAs who are challenging the boys’ club in management education and in the corporate sector. Business schools are also strongly behind them. So also business houses. Not just women, b-schools are also supportive of other underrepresented groups and communities in pursuit of diversity on the campus. For schools, diversity—by gender, race, ethnicity, religion, culture, socioeconomics, sexuality, age, and educational and industrial background—is no longer just a buzz word but an essential characteristic of an environment where better leaders are born. What is diversity? The term brings to mind “visible diversity”—aspects that are external and cannot be changed, such as gender and race. But diversity can be invisible, too—diversity of work experience, marital status, educational background, parental status, and income, says a paper on diversity by the University of Michigan. A combination of various visible and invisible attributes makes up an individual, who would be different from any other individual. “When we recognize, value, and embrace diversity, we are recognizing, valuing, and embracing the uniqueness of each individual,” says the paper. In 2015, Business Insider, along with GraduatePrograms.com, published a ranking of business schools according to their campus diversity. INSEAD, France, was on the top of the list, followed by IE University and ESADE, both in Spain. Ranks four to nine were bagged by US schools: California State University, Los Angeles (4); Yale, CT (5); Perdue, IN (6); Georgia State University, Atlanta (7); Stanford, CA (8); Columbus State University, OH (9); and Hong Kong University of Science and Technology (HK). Gender diversity is usually the top priority on campuses. Read how how business schools are luring female applicants. The 2017 GMAC (Graduate Management Admission Council) Application Trends Survey reports that 64 percent of full-time two-year MBA programs have recorded an increase in the number of women applicants in 2017 compared with 2016. Overall, women represented 42% applications to business education. In full-time MBA programs, the share was up from 2016’s 37% to 39% in 2017.
Business schools have teamed up with various organizations in their crusade for improved diversity. 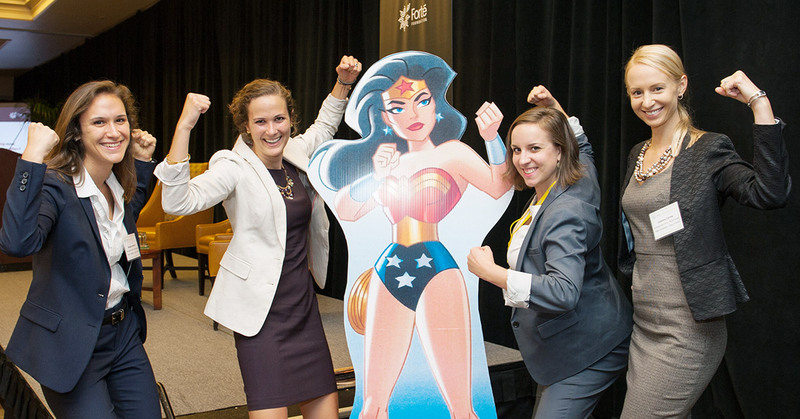 The Forté Foundation supports women in MBA programs and partners with 46 schools worldwide. Forté’s MBALaunch helps women applicants prepare for b-school admissions; its Rising Stars supports women students from various academic backgrounds. In late 2015, Forté reported that 36 member schools had achieved 36.2 percent enrolment of women (fall, 2015), up from 32.3 percent in 2011. A dozen US schools have achieved 40 percent women’s enrollment. Fifty-fifty is the goal for Elissa Sangster, Executive Director, Forté Foundation. MBA Crystal Ball reached out to Elissa Sangster, Executive Director, Forté Foundation, to find out more about the program. Forté Foundation offers career services—job postings and a resume database—for when Forté fellows are ready for their next career move. Elissa has some advice for business schools who are struggling to increase their female intake. Kellogg is one of the schools that partner with Forté. Sally Blount, who was appointed Dean in 2010, the first female dean of a top-rated b-school in the US, speaks about a Kellogg culture that is “courageous, driven, and supportive” of women students. This is obvious: Kellogg’s class of 2018 comprises 41 percent women. At Kellogg, prospective women applicants attend an event where they interact with the school’s Women’s Business Association members and experience the campus. Kellogg’s support continues even after students get jobs: the Kellogg Center for Executive Women gives them opportunity to develop mentors. The Chicago Booth School of Business (42 percent women in its class of 2018) is known to attract women students by broadening the types of MBA degrees to include technology, marketing, analytics, and consulting. Female students benefit from support from student groups, such as the Chicago Women in Business, which organize networking events, mentoring sessions, and get-togethers. The Chicago Women in Business Alumnae Network participates in admissions events that give women applicants to Booth an idea about life on campus from a women’s perspective. Women students’ queries are addressed by the three-decade-old University of Chicago Women’s Business Group, run by volunteer alumnae. The University of Pennsylvania’s Wharton School of Business has maintained women’s enrollment at 40 percent for a few years now. The class of 2018 comprises 44 percent women. Women students have managed to rope in rather unlikely supporters for their endeavor to increase gender sensitivity, by creating the “22s,” a gathering of male students interested in working on gender equality in business. At Dartmouth’s Tuck, too, the class of 2018 has 44 percent women. Tuck’s DivCo (Diversity Conference) reassures student applicants that the school is sensitive to diverse personalities. Old strategies still work for schools with hoary traditions. One strategy that HBS and Stanford started using long ago is to encourage women MBA aspirants to apply at a younger age and not go by conventional wisdom to wait till they are 29 or 30 and apply after acquiring work experience, as this is usually the time that they want to start a family. There are also schools that boast of classrooms where women students outnumber men. Rutgers Business School, Newark and New Brunswick, is one. Among the full-time MBA students earning their degrees in 2016, 51 percent are women, says Lei Lei, Dean. Women students and women graduates receive special mentoring at Rutgers, which invites top women executives to speak to students. Listening to them inspires women students and graduates, particularly, and presents them with role models. According to data from the 2014-15 school year, 63.4 percent of full-time students in the UC-Berkeley (Haas), 54.8 percent of the University of Tulsa (Collins), and 52.9 percent of Louisiana State University-Baton Rouge (Ourso) are female—all three schools feature in the US News top-100 list. Seventy percent of two-year, fulltime MBA programs admit international candidates. China, India, and the US are the major sources for international candidates, according to the 2016 GMAC Application Trends Report. INSEAD’s place at the top of Business Insider’s “most diverse” list is not surprising—its international aura obviously gives it the top spot. Ninety-four percent of its students (from over 80 nations) and 90 percent of its faculty are international. Besides, its international business curriculum attracts the best candidates from the world over. Loyola’s Quinlan, Chicago, Illinois, goes beyond gender in its quest for diversity (50 percent female students in its healthcare MBA program). A report from 2015 says that 27 percent of its students are Asian, African-American, or Latino, says Katherine Acles, Assistant Dean of Graduate Programs. But even as b-schools prepare to increase diversity—so that they reflect the larger business world, which is a demand of corporates—enrollment of minorities remains low. One of the problems is a lack of role models. Schools are struggling to conquer a feeling among minorities that they won’t fit into the b-world mold. There are success stories, nevertheless: Cornell’s Johnson School, for example, managed to increase its minority student enrollment from just 5 percent in 2000 to 21 percent in 2011. Schools’ quest for race/ethnic diversity is bolstered by several organizations, including the National Black MBA Association and the National Hispanic MBA Association. The Management Leadership for Tomorrow (MLT), through its MBA Prep Program, guides members of minority groups through the application and interview process. The Consortium for Graduate Study in Management grants minority students merit-based, full-tuition fellowships through an annual competition. The Riordan MBA Fellows Program prepares and motivates students to compete efficiently for MBA seats and build successful management careers. An alum of New York University’s Stern School says the MLT is an invaluable resource for minority students, and provides quality training along with access to admission officers. She says the Association of Hispanic and Black Business Students at Stern also helped her in reviewing her essays and keeping pressure away on interview day. Schools also get assistance from MBADiversity, a multicultural nonprofit organizations of MBAs and business leaders who want to build a sense of unity among races, nationalities, and genders. The organization lends a hand to MBA applicants preparing for tests, identify financial options, search for jobs, and nurture friendships among students of different backgrounds. It guides b-schools and companies in recruiting diverse talent. Fifteen schools have joined the Robert A. Toigo Foundation’s efforts to find exceptional MBA talent among minorities and award scholarships to students and alumni through mentoring, internships, and job placements within the financial services industry. The Ten School Diversity Alliance, consisting of Anderson, Chicago GSB, Columbia, Darden, HBS, Kellogg, MIT Sloan, Stanford GSB, Tuck, and Wharton, has joined schools’ pursuit of better minority representation. Alex Lawrence, Assistant Dean of MBA Admissions and Financial Aid, UCLA Anderson, admits that the lack of diversity in corporate America reflects to an extent in business schools. Anderson wants to make its student body reflect the general population. In a June 2016 post, US News named the top 10 MBA programs with the highest percentage of full-time students from underrepresented minorities in 2015. The top five programs were those at Howard University, DC (percentage of underrepresented minorities: 84.5); Florida International University (44.2); University of Miami (30.5); American University-Kogod, DC (29); and La Salle University, PA (19.7). Emory University’s Goizueta Business School, Atlanta, Georgia, encourages increased representation of African-Americans, Hispanic-Americans, and Native Americans. In conversation with MBA Crystal Ball, Julie Barefoot, Associate Dean of MBA Admissions at Goizueta, stresses the need for a multipronged approach to ensuring a diverse class. Schools that don’t have a specific plan on diversity will not see it appearing magically, she says. We asked her to share some specific plans that Goizueta has to increase diversity. She says, “Diversity is one of our core values and Goizueta seeks to enroll a diverse group of MBA candidates along a number of dimensions, but most importantly want to have underrepresented groups, specifically minorities (African American, Hispanic/Latino American and Native American) as well as women and veterans represented in our MBA programs. Our commitment to recruiting minorities and women is long-standing and our efforts are multi-faceted. For example, we have partnered with the nation’s leading student pipeline organizations, those being MLT and The Consortium (CGSM) to attract full-time minority MBA candidates and the Forte organization to attract qualified female MBA candidates. And, for almost two decades we have hosted an on-campus minority student recruiting event (now a weekend event). For many years we have also hosted a number of on-campus events to encourage female candidates to consider the value of an MBA degree and to demonstrate that Goizueta is a supportive learning environment for female MBA candidates. As for socioeconomic diversity, b-schools are trying to ease the financial burden that students face, by offering various types of assistance themselves and by providing information about organizations that can come to their rescue. For example, the Columbia Business School partners with Sponsors for Educational Opportunity, which paves educational and career paths for underprivileged communities. As many young people in other countries who aspire to study in the US are concerned about the related economic burdens on their families back home, schools reach out to them with scholarships, tuition discounts, and information on other resources. As many as 27 percent of students enrolled in full-time two-year programs for the incoming class of 2016-17 receive merit-based scholarships, 6 percent fellowships, and 5 percent assistantships. Besides, 4 percent have secured need-based scholarships, 2 percent stipend, 2 percent reduced tuition, and 1 percent on-campus work-study. Business schools along with the Consortium and Forté reach out to applicants from the LGBT (lesbian, gay, bisexual, transgender) community. However, this is not as easy as it sounds, because asking applicants to identify themselves based on their sexuality is a sensitive matter. Gays and lesbians themselves are confused whether they should identify themselves by their sexual orientation. They should, says the LGBT Student Association of Harvard Business School, urging these applicants to be “out” in their MBA applications. It points out that the admissions office has no biases on this score, and it wishes to increase the presence of the LGBT community on the campus. Schools conduct special events to showcase their LGBT-friendly initiatives. For example, Duke University’s Fuqua School of Business has been conducting the LGBT Weekend since 2011. The school also participates in MBA recruiting events that increase opportunities for LGBT community members in business education. Read this article on LGBT community friendly MBA programs & business schools. B-schools also ensure that they have students in different age groups and with varied work experiences and industrial backgrounds. Dia Draper, Director, Strategic Initiatives, MBA Program, Tuck School, says in a post on Tuck’s MBA blog that some people who thought they were too old (read “in the 40s”) for an MBA are now alum or current students. The school has obviously created an environment where “silverbacks” can thrive along with their twenty-something classmates. It sees their maturity, life experience, and career as a resource. Other top schools, too, encourage students with diverse work experience. The work experience of the 2017 incoming class at Stanford GSB, for example, is zero to 13 years. The University of Michigan’s Ross includes people from many industries—20 percent of the class is from the financial services sector, 14 percent from consulting, 10 percent from education/nonprofit, and 9 percent each from manufacturing and technology sectors. Despite the efforts taken by business schools, there’s plenty that can be done. I have close to 4 years of experience as a technical recruiter, i am a B.Tech(Mechanical) graduate and looking forward to do an MBA program to pursue career in the core HR activities rather being a recruiter. Full time MBA or EMBA which one will be a good option for me. I am 28 Years old now. Hello there. I am a chartered accountant from India and ongoing my CFA. Can I get into Harvard. Of course I’ll have to work on my tests. I have work experience in India. But can I get in? And if I do then can I get a job in investment banking at analyst level on MBA finance. This is Ashish working in Oracle and having an experience of 5 years with a consultant position and a client facing experience, i have an active GRE score of 296(138V/158Q/2.5A). I couldn’t think of retaking the exam again. Just out of curiosity i am thinking of doing Executive MBA or PGPX of One year. Wanted to know the possibility to get into one year full time program of ISB. Hi Sameer, I’m an engineering student from IT, going to graduate soon. I have an interest in project planning and in analyst positions in IT companies. Will an MBA be useful? In what discipline? Hello Sameer, I am Sudiksha. I am in my BA second year for now and i am looking forward to pursue a career in MBA from a foreign university. I am confused about the countries which can be a good option for studying and also the job prospects in the same. I dont have any work experience as you can see. I need some guidance here . So help me with this. I have a technical background with 6 years of experience in IT industry. I am currently preparing for GMAT, what do you think should be my target colleges for executive MBA? @Santosh: Full-time MBA always better than EMBA if you can manage it. @Ashish: Your experience would be a good fit for programs like ISB. Too early for PGPX. @Brins: You can consider options like PMP. Cheaper and more relevant to what you are doing.